Brian Fantana: "I mean come on Ed, it's bull crap! Don't get me wrong, I love the ladies. I mean they rev my engine, but they don't belong in the newsroom!" Champ Kind: "It's anchorMAN! Not anchorLADY! And that is a scientific fact!" Brick Tamland: "I don't know what we're yelling about!" Brian Fantana: "You're with us, Ron, what do you think?" Ron Burgundy: "She... Sh... It's terrible! She has beautiful eyes, and her hair smells like cinnamon!" Little Girl: "You are an awful man! You are truly a disappointment to us all Mr Burgundy!" Ron Burgundy: "I know that one day Veronica and I are gonna to get married on top of a mountain! And there's going to be flutes playing and trombones and flowers and garlands of fresh herbs! And we will dance till the sun rises! And then our children will form a family band! And we will tour the countryside and you won't be invited!" Veronica Corningstone: "You look like a blueberry!" Veronica Corningstone: "Mr Burgundy, you are acting like a baby." Ron Burgundy: "I'm not a baby, I am a man! 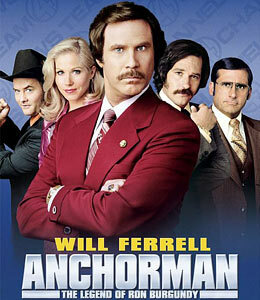 I am an anchorman!" Veronica Corningstone: "You are not a man! You are a big fat joke!" Ron Burgundy: "I'm a man who discovered the wheel and built the Eiffel Tower out of metal and brawn! That's what kind of man I am. You're just a woman with a small brain. With a brain a third the size of us. It's science." Ron Burgundy: "You know how to cut to the core of me Baxter. You're so wise. You're like a miniature Buddha, covered with hair." Ron Burgundy: "You pooped in the refrigerator? And you ate a whole wheel of cheese? How'd you do that? I'm not even mad... that's amazing." Ron Burgundy: "For all of us here at news center 4, I'm Ron Burgundy. You stay classy San Diego." Champ Kind: "What in the hell is diversity?" Ron Burgundy: "Well, I could be wrong, but I believe diversity is an old, old wooden ship that was used during the Civil War era." Ron Burgundy: "Brick, where did you get a hand grenade?" Brick Tamland: "I don't know." Ron Burgundy: "Now before we do this, let's go over the ground rules. Rule number 1, no touching of the hair or face!" Ron Burgundy: "And that's it! Now let's do this!" Brian Fantana: "Ron I know it sounds harsh, but God does not what her to live." Brick Tamland: "I love carpet. I love desk." Ron Burgundy: "Brick, are you just looking at things in the office and saying that you love them?" Brick Tamland: "I love lamp." Ron Burgundy: "Do you really love the lamp, or are you just saying it because you saw it?" Brick Tamland: "I love lamp! I love lamp!"